Dreams remain a mystery. Are they really windows into another world, another dimension? Or are they simply action replays of the mind, replayed while we sleep? But then, where do we go when we sleep? The aircraft seemed impossibly high - a tiny dot against the expanse of milky clear azure sky. It seemed crazy that I could hear it but I could, clear, but so very distant. Apart from that it was warm, quiet and peaceful. I looked at the mown grass beneath my feet before looking up to the sky again. I wasn’t sure just where I was. I stood on a large lawn surrounded by high walls, outside of a large building. 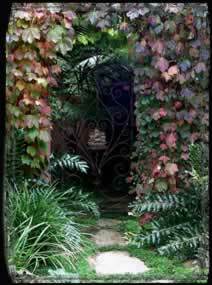 The walls enclosing the grassy area—about half a soccer pitch size—were old and on one section thick ivy grew around and overhung an arched doorway and its closed ancient looking heavy timber door. I wondered what lay beyond. The overhead dot was moving too slowly, spinning a faint white thread that died before it could properly make its presence visible. My vision telescoped and zoomed in on the plane and I saw it was a big, military type aircraft without any visible markings. Two large bomb bay-type doors swung slowly open in the plane’s underbelly and I wondered how I could see in such detail from such distance as an object fell from the open bay and appeared to pause a moment before dropping away into free fall. It rapidly closed distance and in what was a ridiculously short space of time suddenly hovered some feet from the ground a few yards from where I stood before gently settling down to the grass. It was a dull, metallic cylinder about eighteen inches long, some six inches in diameter and squarely closed off at each end. Out of curiosity I moved towards it and became aware that a few people had gathered on the lawn and were now milling about in some apparent confusion. "Don’t touch it! It’s a device…" a voice yelled out. I looked but could not identify the caller and continued moving toward the object. As I neared it the people started running away in all directions. I reached down and touched the cylinder. It felt slightly warm and a barely visible seam in the middle suggested it was constructed of two sections. As I straightened with it in my hands I heard another now distant voice yell at me to put it down. I could see no one. The cylinder resisted my strenuous attempts to separate the sections and I turned it over in my hands, puzzled. Then the strangest thing happened, as if what had already occurred was not itself strange enough. The cylinder began to open of its own accord. Alarmed, I quickly put it back to the ground and heard more shouts of warning, this time from several male and female voices. Still no one was in sight. I acknowledged their shouts in my thought but they seemed to hold no real importance. As I quickly turned back to the cylinder it completed its opening process and came apart. What happened next defeated all my attempts of explanation. What I can only describe as a cone of faintly crackling, ethereal multi-hued electrical energy emerged, rose and hovered for a moment above the cylinder, the sharp end of the cone pointing downward. The cone itself was some twelve inches high and perhaps eight or nine inches across the width of its upper funnel. There was a subdued humming sound, almost indefinable yet apparent and the cone seemed somehow to be gently possessed with its own free will. It hovered for a brief moment then moved away towards the nearby building and entered through an open patio door. A moment later I found myself giving chase. The room was empty except for a single bed. In my haste to follow the cone I was unable to be certain if the bed was occupied or if it was empty. The cone left the room through a door leading onto a corridor. I felt compelled to hurry after it. The corridor was busy with scuttling people, many in white medical smocks. They seemed nervous and disturbed, pushing past each other as if in a rush to be somewhere, though just where wasn’t at all clear. "Clear the building!" I heard someone shout. I couldn’t see the cone and spent a moment looking from end to end of the corridor in a bid to locate it. Inexplicably I felt a mild panic at the thought of losing it and tried to stop someone passing to ask if they’d seen it. The woman pushed past me. "I have to go. Sorry," she said in a terse voice. She hadn’t even looked at me. I stood stupidly watching her blunder away along the passage and then something touched me on the top of my head. The point of contact was just behind the immediate centre of the top of my head—the exact crown—and an indescribable feeling flowed through me, seeming to energise, invigorate and revitalise every molecule of my being and unlike anything I had ever known, as if a revitalising electrical energy had infused my being. In a moment it was gone, leaving me feeling strangely galvanised. "There it is!" a man yelled and a woman screamed. I looked down the corridor and saw the cone was beyond the last of the people and was drifting towards a double door at the end. Without having seen it, I somehow instinctively knew it was the cone that had touched my head, that it had poured its energy into me. The question why did not occur to me. Scared that I might lose it, I chased down the corridor in time to see it pass straight through the two closed doors at the end as if they were not there. 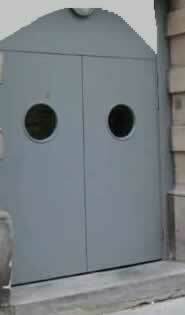 I ran to the doors and peered through one of the two porthole-style windows. They looked out across grass towards the arched ivy-covered doorway I had seen in the wall and I saw the cone pass straight through the timbers of that door, as if it too was not there. Pushing the double doors open I gave chase but was delayed by the timber door. An old rusty ring pull was below a big rusty bolt drawn shut that took a great deal of persuading to draw free. Still the door wouldn’t budge and then I spotted the large key sticking out of the lock. It turned as though a prop in a Hammer horror movie with a long stuttering creak and then the sturdy wooden door was slowly squeaking open on its rusty hinges. I was not at all prepared for what lay beyond. A vast barren plain stretched as far as could be seen, barren but for hundreds, perhaps thousands of scattered people running from the left towards some unseen destination far to the right. The sparse grass and earth of the plain looked parched and a few tumbleweeds lazily bounced in the same direction that the people were running. None of it made any sense but I guessed they were running after the cone. I ran through the doorway and out onto the edge of the plain. Far off to the right the crowd of people grew thicker and then I saw a tall round stone tower in the distance, its base black with people like ants around a nest. I started to run toward it. I don’t know how long I ran, but those running around me seemed unaware of each other. They all just ran without looking around, just staring straight ahead toward the distant tower. As I neared it and drew among the now pressing and thickening crowd a hundred metres or so from the round stone vertically elongated Martello-type tower, I could see the crowd was funneling itself through the one small door leading in. No windows were visible and there was no sign of any activity at the top, perhaps some one hundred and fifty feet above. "What’s happening?" I yelled to all but no one answered or took any notice. "What’s going on?" I yelled again. It was as if I wasn’t even there. I thought that perhaps the cone had entered the tower and began pushing a way towards the door. No one offered any resistance to my shoving and pushing and a few tense moments later I was close to the door, being carried forward now by the press of the crowd. Still the people seemed oblivious to each other as they squashed in fours and fives through the door and then I too was inside. The tower contained nothing except an earthen floor and a very dilapidated and rickety wooden stairway fastened to the inner stone wall and spiraling up towards the top. The stairs were dangerously full of people making their slow way up towards and out of an opening at the very top of the tower, though I had seen nothing from outside. I thought the stairs looked perilously close to collapse. I grabbed and shook a young woman who was in the knot of people pushing towards the start of the stairway and yelled at her that the stairs were unsafe and about to fall. She turned and looked at me with blank, somnambulant eyes then turned her sight back to the stairs. Desperate but somehow resigned, I shook her again. "Its going to collapse - the stairs are going to collapse," I yelled. She took no notice at all and shrugged away from me to step closer towards the stairway. I heard a terrible groan as a large section of the overburdened stairway somewhere above lurched under the impossible weight. I pushed my way back to and out of the door while the seemingly mesmerised crowd still bustled for entry. The dream ended and I awoke startled, wondering where I was, trying to collect my senses with the reality of the dream still embracing me. It was not yet light and a bright moon shone through the barred window from across Princeton Tor. Soon the rattle of keys would sound and another day would begin at Dartmoor jail. I started pencilling notes into my notebook so that I would not lose the thread of the dream. The dream of the cone was the third in a series of equally vivid dreams, but it was perhaps the strangest, although the one in which I was being chased by an articulated truck as I ran up a wide spiral ramp inside the London Post Office Tower was weird enough. Baffled by the vividness and oddity of the dreams, I’d noted the dates I’d had them. Yet it would be several years before the dream of the cylinder and cone would take on an astonishing new hue of meaning. Four years later, on returning to London and looking up some old friends, I learned that a very close and good friend, Ronnie Johnson, had died in hospital on the same night that I had experienced the dream of the cone. Aged 27, he was one of the first people in England to contract HIV after using an infected needle whilst caught in the throes of heroin addiction. Combined with severe hepatitis, his vital organs collapsed and he died. At the time, the illness was not correctly identified and was put down to hepatitis alone. His sister Kathleen showed me some penciled sketches he had drawn in the hospital, shortly before his death. One sketch showed a cylinder at the top of the page and two operating theatre-type doors in the centre of the page each with small porthole-type windows. I said that the dream of the cone was the hardest of the three for me to understand. It remains so, for at the base of Ronnie’s sketch pad page was a pair of perfectly drawn hands neatly ending at the wrists and drawn with immaculate detail, with both open hands palms uppermost and resting on top of each other, almost as if waiting to catch something falling from above.